Once upon a time, a young college freshman found a company that would pay him the exorbitant salary of $14 an hour to sit in front of an Atari 800 and write a computer game. He didn't know a thing about writing a game, but he was a trained graphic artist and had some experience writing music. So he gave it a whirl. Six months later Datasoft, Inc., released one of its first games, Clowns and Balloons. Since then, the freshman went on to work for other companies, and eventually founded his own computer software company that currently offers ST products. But, the name Clowns and Balloons haunted him as his first, and probably best known, work. Years later, when his Atari 800 found itself put out to pasture, the idea of writing a new version of Clowns and Balloons kept coming up. 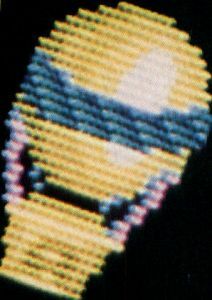 The publishers of ST-Log found that, with the right amount of coaxing, Clowns and Balloons would finally see the light of day on the ST computer. A deal was struck and some work begun. But the project was dropped and remained idle for more than a year-while the project was fun to work on, it didn't pay the monthly bills. When the Clowns and Balloons ST project was recommenced and finished, the name just didn't suit it anymore. The graphics were completely different, the game play more difficult, the music was rewritten and some of the animation was modified. So, the name was changed. Here, then, is Monkeys and Balloons. Monkeys and Balloons will run on any Atari ST computer: Atari 520ST, 1040ST, Mega 2 and Mega 4 systems. The game uses your ST's mouse as its joystick, controlling player movement. The program is designed to run in low-resolution mode; so a color monitor is required. From the GEM Desktop, open the file titled MB.PRG. You can open a file by clicking the program icon once, then selecting the "Open" option from the File drop-down menu. You may also double-click the program icon. Once the program is started, the title screen will appear and you will hear some music. The music volume is controlled from your color monitor's volume control knob. After a few moments, a demonstration of the game play will appear. While either viewing the title screen or the demonstration, click the left mouse button to start a new game. Welcome to the exciting world of the circus. Cotton candy, peanuts, clowns and balloons are all waiting for your enjoyment. Clowns bounce through the air, while monkeys carefully balance a trampoline close to the ground. Move the trampoline below the clown and everything is fine. The clown bounces higher and higher, trying to catch some of the floating balloons. Miss the clown, and you won't get any bananas tonight! As the monkey trainer, you control which way the monkeys move the trampoline by moving the ST's mouse left and right. The monkeys can control where the clown will bounce by moving the trampoline slightly when the clown bounces. The clown will bounce straight up and down if he lands right in the center of the trampoline; the farther from the center, the more of an angle he will bounce at. There are three rows of floating balloons above the monkeys. When the clown's hat touches a balloon, it pops and you are awarded some points. The higher the balloon, the more points are awarded. The object of the game is to clear each row of balloons from bottom to top. If you clear the second or third row of balloons before clearing the bottom row, the higher rows will fill up again with more balloons. When you clear all of the balloons, a bonus award will be given and the next level will begin. At first, the clown will not bounce very high. The longer the clown continues to bounce, the higher he will go. The clown also bounces faster as the game is played. While the game is being played, pressing the space bar will terminate the program and return you to the GEM Desktop. 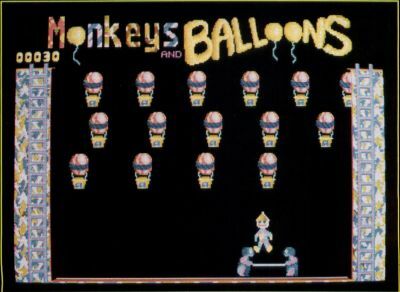 Monkeys and Balloons stores the color palette in use when the program is first started. The program then switches the resolution of the screen to low resolution, storing the current resolution. When exited, Monkeys and Balloons restores the resolution and color palette. This should be standard practice for all games on the ST, but rarely is. William Robinson (author of Atariwriter) has developed his own 68000 assembler, which was of invaluable help in completing this project in a relatively short amount of time. William's assembler takes standard 68000 code and turns it directly into a PRG program file, ready for running from the GEM Desktop. Other assemblers have to go through two or three steps before they are finished. William's assembler compiles the Monkeys and Balloons source code in under eight seconds! The only problem with William's assembler is that it has not been released to the public. William does not want to support it; so for the moment it isn't available. However, William is easily swayed to public opinion, so writing him a letter might change his opinion. All of the graphics were developed using DEGAS Elite, The graphic files are stored in the normal DEGAS compressed format. When the program is run, all of the graphic files are loaded into the ST's memory and decompressed. The decompression routine took only a few hours to write and can easily be used in other programs, Since the files are DEGAS compatible, you can easily create your own graphics for the game. If you come up with something, be certain to send a copy to ST-Log. The music routines turned out to be the most difficult part of the project. The note and duration of the music was developed by hand-coding the songs from their original sheet music. Certainly other methods of capturing music data are possible with the ST, but at the time none were known. Once the notes were entered, the problem of how to generate sounds became a problem. Atari's ST documentation is completely void of any information on sound generation. Michtron's Concise Guide to the Atari ST showed how to create a frequency, but said nothing about generating notes from a musical scale. Finally, a friend found a small table of frequency to note values in Abacus ST Graphics and Sound. The entire project took less than three weeks of full-time effort to complete. The graphics were developed in about five days, with the balance of the effort spent on programming and debugging. If you have any ideas or feedback on the game, please send them to ST-Log. There is a whole library of games like Monkeys and Balloons that could be developed with the right encouragement! Frank Cohen has been writing Atari software since Clowns and Balloons, his first 8-bit game. He founded Regent Software in 1985 and has recently completed Regent Base 2:4GL SQL Database for the ST and Mega computers. He can be reached directly on CompuServe, DELPHI and GEnie, or by writing to him at P.O. Box 14628, Long Beach, CA 90803.